A System of Geography with New Maps. 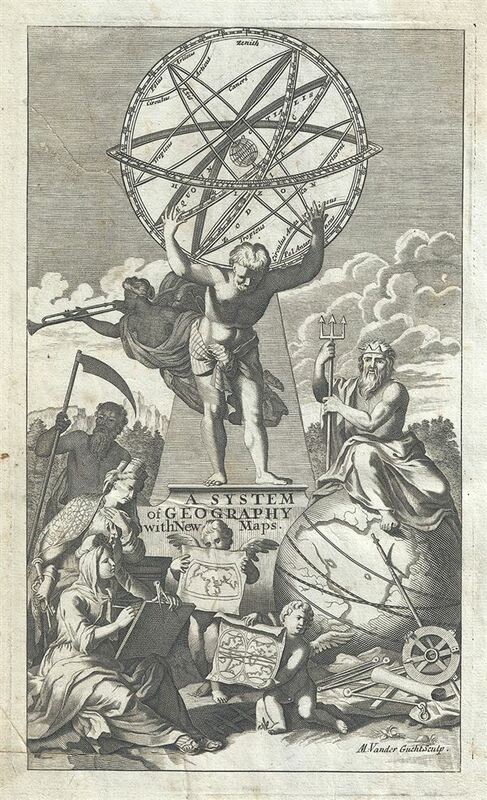 This is a beautiful diagram of an Armillary Sphere which appears as the title page to Herman Moll's System of Geography. It depicts Atlas, the titan of astronomy and navigation in Greek mythology, holding the armillary sphere. Neptune, the God of the Sea is shown sitting on a globe, while other Gods and Goddesses look on. Two cherubs are seen holding up world maps. The Armillary Sphere is an old astronomical observation device used to differentiate between the Ptolemaic system and the Copernican system, by displaying the relationship between the various objects in the sky. The illustration here depicts the central terrestrial globe with rings representing the main celestial circles. This beautiful title page was engraved by M. Vander Gucht and issued as the title page to Herman Moll's 1701 edition of A System of Geography. Moll, H., A System of Geography: Or, A New and Accurate Description of the Earth In all its Empires, Kingdoms and States (London), 1701. Very good. Minor creasing and toning with some spotting at places. Original platemark visible. Pasted on paper, as issued.